The recent General Data Protection Regulation (GDPR) builds on the existing Data Protection Act and now requires anyone who holds and uses personal data in their business to provide a Privacy Notice. It should provide a clear and concise outline as to what personal information is held about you, how and why it is used including whether it is shared with third parties, how long it is stored and your rights of access to this personal data. In addition I continue to be bound by the ethical framework and the accreditation requirements of the professional bodies with whom I am registered: the British Psychoanalytic Council (BPC) and the United Kingdom Council for Psychotherapy (UKCP). 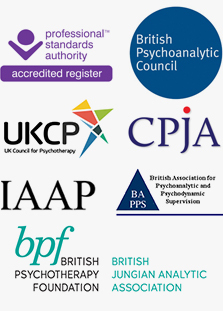 These organisations are concerned primarily with maintaining high professional standards within the field of Psychotherapy and Jungian Analysis. They oversee the accreditation and reaccreditation of the psychotherapists registered with them (education, training, and continuing professional development) as well as addressing and maintaining ethical standards, safeguarding and quality assurance. I store and use the personal information that you choose to share with me to enable me to undertake my work as a Jungian Analyst, Psychotherapist and Supervisor. Without this information I would be unable to provide a professional service to you. It enables me to keep in contact with you; to maintain my accounts and records in line with current tax requirements; and most especially to think about and explore with you the issues that brought you to seek therapy or supervision (within the ethical framework, requirements and guidance of my professional registering bodies). My understanding is that under GDPR, the lawful basis of such information usage is referred to as, ‘legitimate business’. Name and contact details: Home address; Telephone number(s); Email address. Sessions: Day(s) and time(s); date work began/ended. Agreements that guide how we work together: e.g. Initial appointment letter and initial consultation; other correspondence or reviews as appropriate. Background Notes,brief and pertinent to our work: e.g. area(s) of concern which brought you to seek therapy; date of birth; family history; key life events; current support network; GP name and address and relevant medication (where appropriate). Your personal data is held in the strictest confidence; I continue to comply with the law (Data Protection Act and now GDPR) and to operate within the framework of the ‘Statement on Confidentiality’ of the BPC. I do not share personal information with third parties unless it is at your specific request and/or with your informed consent following on from a full discussion between us. Rare exceptions to the disclosure of confidential information are in circumstances of significant threat to life, of yours or other(s). In addition, I have two trusted colleagues who act as my Clinical Trustees. They keep a sealed copy of the contact details of the people with whom I work – specifically name, address, phone number and email address – so that you can be contacted in an emergency and I am unable to contact you personally. This is in line with good practice and a requirement for all registered practitioners of the BPC & the UKCP. I seek to maintain the highest professional standards. In order to improve my clinical work, I use anonymised data to reflect upon the nature of issues arising in the work. This may be a process of self-reflection or may be in the setting of a clinical consultation or supervision where I reflect upon the work with experienced BPC and/or UKCP colleagues. Clinical supervision forms a vital part of my on-going Continuing Professional Development (CPD); again, it is both good practice, and a requirement of both the BPC and the UKCP. Please note that when you contact me through my website the automated email is sent via the WebHealer mail system. For privacy reasons your email is not accessible to staff at Webhealer, and is not stored on any of their systems but rather forwarded straight to me; the Webhealer server uses a secure link comparable to those used by banks to transmit the message. However if you email me directly ([email protected]) this will use a standard link via the gmail server. Both Webhealer and Gmail state that their company is GDPR compliant. When we end our work together I usually keep your personal information for at least six years after the finish date; this is in line with good practice, in case you should wish to return or there is any query about the quality of my work. If you do not wish me to hold any aspect of this data then you need to contact me to clarify what data will be held and for what time period. GDPR spells out your access rights including that you have a right to be aware of the data I collect, to be able check and correct the data and to explore and challenge the way in which I use it. If you have concerns please discuss them with me so that we can explore and address any anxieties or issues together. Lynda Norton is a qualified Jungian Analyst registered with both the BPC (British Psychoanalytic Council) and the UKCP (United Kingdom Council for Psychotherapy). She is a senior member of the BPF (British Psychotherapy Foundation), working in private practice as a Jungian Analyst, Psychotherapist and Supervisor in Welwyn Garden City. How do you collect data …. and what data is being collected? I collect and process brief information relevant to my work as a Jungian Analyst and psychotherapist which you choose to share with me as we explore and think about your concerns. Background Notes,brief and pertinent to work: e.g. area(s) of concern which brought you to seek therapy; date of birth; family history; key life events; current support network; GP name and address and relevant medication (where appropriate). Using the categories identified by the Information Commissioner’s Office (ICO) this information may include personal details: family details; lifestyle and social circumstances; goods and services; financial details; and employment and education details. On occasion I may also process sensitive classes of information as defined by the ICO such as: physical or mental health details; sexual life; racial or ethnic origin; trade union membership; religious or other beliefs of a similar nature; offences and alleged offences. I process personal information which you share with me solely to enable me to undertake my work as a Jungian Analyst, Psychotherapist and Supervisor as requested. Using the categories identified by the ICO, my understanding is that this can be regarded as lawful usage since it is legitimate business interest under GDPR. This personal information enables me to: keep in contact with you; to undertake psychotherapy and Jungian Analysis i.e. think about and explore with you the issues which have brought you to seek therapy or supervision in line with current good practice; and to maintain my accounts and records in line with current tax requirements. I do not use your data for marketing purposes. Your personal data is held securely and in the strictest confidence. Electronic data is stored on my password-protected computer and/or phone. Paper data is stored in locked filing cabinets. Will the data be shared with anyone else? This is ordinarily confidential to the psychotherapy relationship. I do not share personal information with third parties unless it is at your specific request and/ or with your informed consent following on from a full discussion between us of the matter. Emergency: I have two trusted experienced colleagues who act as my clinical trustees. They keep a sealed copy of the contact details of the people with whom I work – specifically name, address, phone number and email address - so that you can be contacted in the event of an emergency and I am unable to do so myself. This is in line with good practice and a requirement of both the BPC and the UKCP, the national professional bodies with whom I am registered. Serious risk to self or others: I may need to contact other professionals e.g. when someone is very unwell I may need to contact their GP or other appropriate professional to express my concerns for their well-being or for the well being of others. This might include determined, active intention to commit suicide; or children / minors currently at risk of abuse. As stated previously, whenever and wherever possible this step would always be discussed with the person beforehand and permission sought before such contact is made. I use anonymised data, to reflect upon the nature of issues arising in the work in order to improve my clinical practice and serve the best interests of the people with whom I work. This may be a process of self-reflection or may be in the setting of a clinical consultation or supervision with experienced, qualified colleagues. Clinical supervision is recognised as good practice and forms a vital part of my on-going Continuing Professional Development (CPD); it is a requirement of both the British Psychoanalytic Council (BPC) and the United Kingdom Council for Psychotherapy (UKCP) the national professional bodies with whom I am registered. When we end our work together I usually keep this personal information for at least six years after the finish date; this is in line with good practice in case you wish to return or, there is any query about the quality of my work. With enquiries, I usually keep any personal information for six months after the initial enquiry and/or initial consultation; this is in case the person contacts me again with a view to following up their enquiry about psychotherapy. GDPR spells out your access rights including that you have a right to be aware of the data I collect, to be able check and correct the data and to explore and challenge the way in which I use it. Right to restrict processing to be able to block or suppress processing of personal data . Right to object to processing based on legitimate interests or the performance of a task in the public interest/ exercise of official authority (including profiling); direct marketing (including profiling); and processing for the purposes of scientific / historical research and statistics. You can read more about your rights at https://ico.org.uk/for-the-public/is-my-information-being-handled-correctly/. How can I access and update my information or raise a query or a complaint? If you have concerns please speak to me so that we can discuss, explore and address any anxieties or issues together informally. The accuracy of your personal information is important to me and so you can ask for any mistakes or inaccuracies to be corrected. You can also request a copy of the personal information I hold about you. If you prefer you can also write to me making a ‘subject access request’ under the GDPR (General Data Protection Regulation). Again, I will try to deal with your request informally by speaking to you in person so that I can understand more fully and where necessary address any concerns. This may include: giving you a description of it; telling you why I am holding it: telling you who it could be disclosed to; and letting you have a copy of the information in an intelligible form.